A hearty breakfast that you can dress up with fruit. Sift the flours together with the confectioners’ sugar, baking powder, and cinnamon into a medium mixing bowl. Set aside. Combine the eggs and milk in a small mixing bowl and whisk to combine. Whisking constantly, beat the milk mixture into the flour mixture. When well combined, stir in the rice. Heat a griddle or nonstick frying pan over medium-low heat. 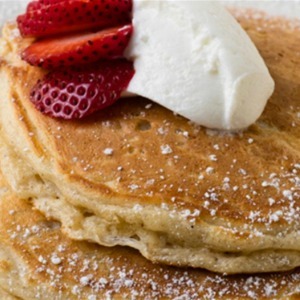 Ladle the pancake mix into the hot pan, about ¼ cup at a time, smoothing out the batter to make an even circle. Do not crowd the griddle or pan. Cook for about 4 minutes or until bubbles form on the top and the bottom is golden brown. Flip and continue to cook for an additional 5 minutes or until the pancakes are cooked through and golden brown on both sides. Reduce the heat if the pancakes are getting too brown before fully cooked. Serve hot with yogurt and fruit, maple syrup, confectioners’ sugar, or honey. 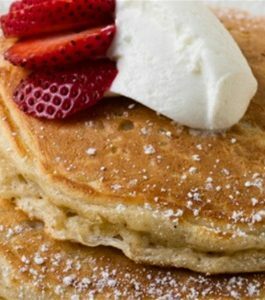 Tips: For gluten-free pancakes replace the all-purpose and whole wheat flours with any gluten-free flour you would normally use for baking.